Outbrain’s dashboard is packed with awesome campaign insights that can be used to optimize your performance in our platform. It’s okay if you don’t know where to start; below, we’ve pointed out a few main areas to pay attention to when exploring the dashboard. Want to schedule a report so that it’ll be sent to you automatically? Our dashboard can do that! 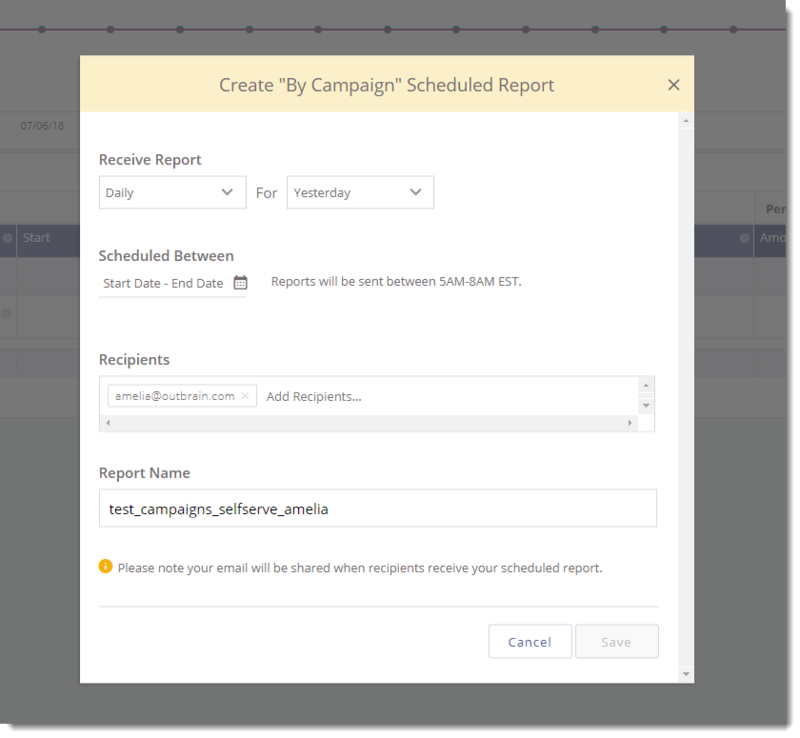 Click on the calendar icon on the top right of your “Campaigns” dashboard, and adjust the time to a pre-set or custom date range. Choose how to section out your data by clicking on the breakout folders above the graph. In this view, you will also be able to click on an interactive map that displays various metrics based on each location. Keep in mind, DMA is a US-based metric. Global users can target more specific US-demographics using “By DMA.” We do not display data older than April 2017. When setting up your campaign, you can choose between Desktops, Tablets, or Smartphones. By default, our system selects all three platforms, so be sure to uncheck any that you don’t want to target prior to saving. The visualizer will then plot the data by platform for the campaign and date range selected. 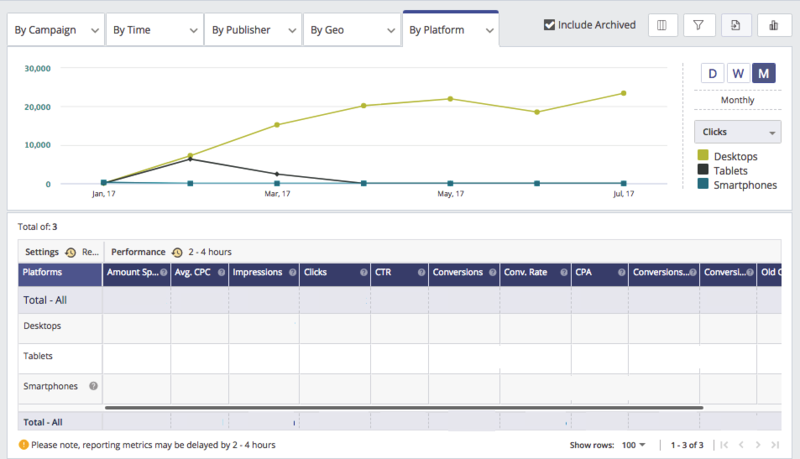 You can view spend, clicks, and other metrics here. You may compare sets of performance metrics that are most important to your campaign strategy, and map them out on the data visualizer. Select these from the right side rail to plot them out. You can also select the time interval that each data point will represent. This can be either by D-day, W-week, or M-month. 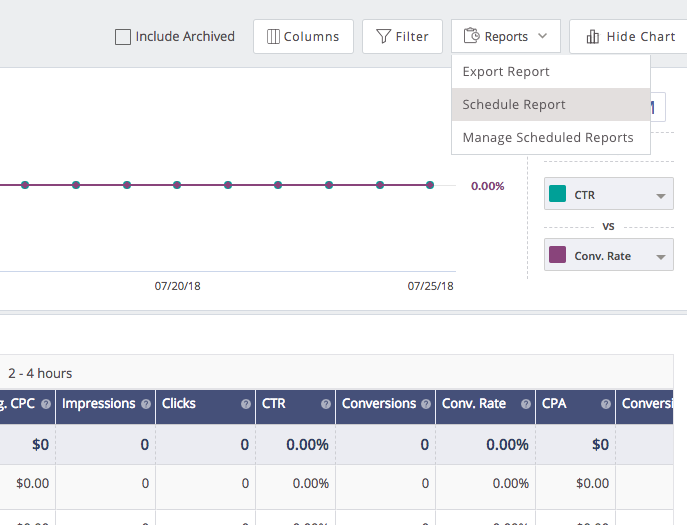 If you have specific KPIs you’re measuring your campaign success against, you can add any number of filters to your reporting. Click on the “Filter” button to enable this view. Then, select from the filter(s) at the top of your performance visualizer. For each filter, you may enter values that are relevant to your analysis. 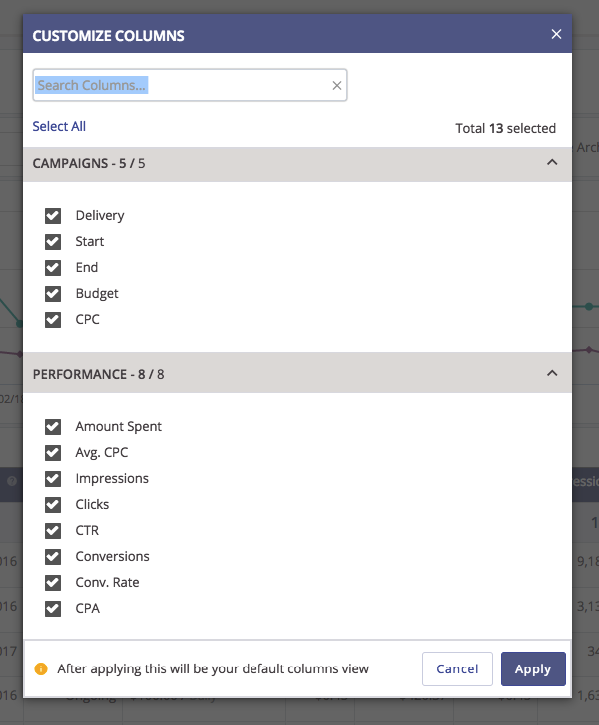 If you’re only interested in viewing the performance of a specific campaign and its content, click the campaign name and view custom reports on its “By Content” view. For later review, or for application against future campaigns, you can refer back to your Campaigns dashboard, or export the data from the top of your dashboard view. If you want to create a customized view of your dashboard, click on the Columns button to select the format of your dashboard. Once saved, your dashboard will load the specific layout you had chosen every time you log in. You can schedule reports to be sent to your email address and others’. For a quick demo of this feature, click the video below. To Schedule a Report, first select the desired report view. 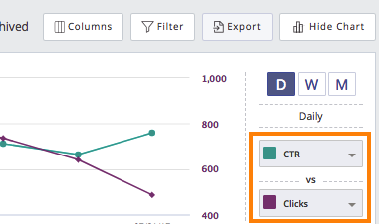 To do this, choose how to section out your data by clicking on the breakout folders above the graph (By Campaign/By Publisher, etc.). Any filters you set will also be included in your scheduled reports. Once you’ve selected your report view, click the Schedule Reports option under the Reports button in the Upper Right corner of the Dashboard. On the Create A Scheduled Report window you’ll be able to customize how frequently you want to receive the report, what reporting period you want the report to cover, what date range you want the report to run (up to 1 year) and what email addresses you’d like the report to be sent to. Reports can be sent to up to 10 recipients. To Manage your Scheduled Reports, click the Manage Schedule Reports option under the Reports button or click the Scheduled Reports button on the left side of the Dashboard. On the Manage Reports section, you can review the scheduled reports’ details and status, edit your existing scheduled reports, or delete scheduled reports. You can have up to 10 active reports at a time. Scheduled reports will become inactive once their set date range has ended or if all recipients unsubscribed / manually removed from the report. Data in the Amplify dashboard is split up into two sections: “Settings” and “Performance.” All of the data under “Performance” (Amount Spent, Conversion data, Clicks etc) is subject to a 2-4 hour reporting delay. Data recorded under “Settings” (Budget, Delivery, CPC, etc) is in real time. One metric to pay close attention to is the “Budget” as it will display the updated spent amount under the budget you had set. When viewing a region or DMA report, you may see traffic listed under “Other”. This pertains to traffic that is unrecognizable by our IP locators. You will not be charged for clicks outside of the locations you are targeting. For reports that you schedule, please note that your email address will be shared with the recipients when they receive the report. Scheduled reports will be sent by 7AM EST. Unlike manually exported reports, the scheduled reports will include data inclusive of the previous day’s data. It will not include today’s data. If you have any questions about reporting, you can email your support team with your account name, and any relevant campaign names for assistance.